A Russian Su-24 flew 12 passes over the USS Donald Cook in the Black Sea. How quickly things change in the Black Sea. A couple months ago, during the Sochi Winter Olympics, the United States stationed the USS Mount Whitney and USS Taylor in the Black Sea to assist the Russians should a major security incident occur. Today, several weeks into Russia’s annexation of Crimea and the ensuing international crisis over Ukraine’s territorial integrity, reports emerged that a Russian Su-24 jet made several low altitude, close passes in the vicinity of the USS Donald Cook in the international waters of the western Black Sea. The jet did not overfly the ship’s deck nor was any fire exchanged between either party, but the move is nonetheless reckless and dangerous at a time when tensions between Russia and the United States are high. Any miscalculation could have a high cost. For the moment, the Pentagon does not believe that the incident was a case of a Russian pilot joyriding over the Black Sea. “I would have difficulty believing that two Russian pilots, on their own, would chose to take such an action,” Warren notes. Instead, the Pentagon is reading this as a continuation of unorthodox Russian military conduct, which has been going on throughout the duration of the Ukrainian crisis (recall the initial entry of Spetsnaz into Crimea without any national insignia on their uniforms). Little else is known about the intention of the lone Su-24, including if it was part of the Russian air force or the navy, or on whose command it was flying. The Su-24 is capable of carrying a significant weapons payload, including anti-ship missiles. The move came shortly after U.S. President Barack Obama spoke with Russian President Vladimir Putin to work towards resolving the crisis in Ukraine, with little luck. Additionally, CIA Director John Brennan was in Ukraine over the weekend. Ukrainian authorities have taken to forcing pro-Russian activists and separatists in the eastern part of the country out of government buildings. 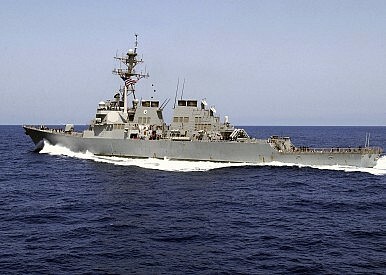 The ‘buzzing’ of a U.S. warship in the Baltic shows why we shouldn’t exaggerate risk of conflict.